The first Anglican services were held in Croydon in the year 1878 in a small weatherboard building at the corner of Croydon and Whitehorse Roads. The first recorded meeting of parishioners was on 5 August 1896 when “there were only five persons present due to the inclemency of the weather”. The parish at that time was a part of the Ringwood Parochial District. The population of the area increased steadily, and the railway line was extended to Croydon in 1900. A new church was built in Croydon Road opposite Surrey Road, and dedicated on 29 August 1906 by the Archbishop of Melbourne, Henry Lowther Clarke. In 1920 the Parochial District of Croydon was established. It was soon realized that a larger and more centrally located church was necessary, and the present site was bought in 1922. The Croydon Road church building was moved to the new site in October 1922. After protracted fund-raising activities, a start was made on the building of the present church. 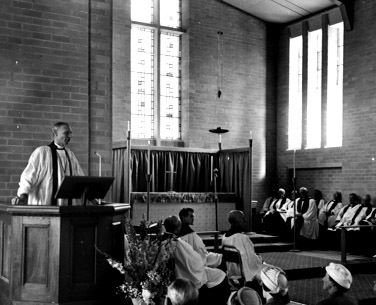 (Described in newspaper article Turning the Sod ) The church was dedicated by Archbishop Frank Woods on 21 December 1957.